I noticed over at Find A Grave that they now have 19 million grave records which you can search, in their non-famous grave area (for most of us, those would be where our ancestors are listed!). When I first starting using this wonderful site over six years ago, I believe they only had about 5 or 6 grave million records. 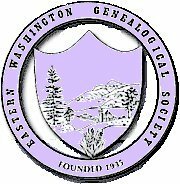 Even a year ago, when I presented a tutorial on using this site to the Eastern Washington Genealogical Society, there were only about 13 million grave records! If you would like a copy of my syllabus from that presentation, please e-mail me at kidmiffatgmaildotcom (substitute appropriate symbols in this phrase). October 31st isn't just the day that marks Hallowe'en. It also is a deadline for two events important to EWGS. The first is that the society contest at RootsTelevision ends that day. See their graphic icon over there on the right? Click on it and visit their site for wonderful, helpful, humorous genealogical videos! The society or organization that brings the most traffic to RootsTelevision during this, their one-year-anniversary month, will win a $1,000 prize! We've got a link on our webpage, too! Og recommends that when you click on the link to RootsTelevision from our website and blog, " be sure you let the page load completely (until the video actually begins to play) before you navigate out of the Roots Television website. You may even want to click on an extra page inside of the RTV site for good measure." E-mail your family, friends, and good-natured co-workers to help us out! Send them the links to the blog (http://ewgs-spokane.blogspot.com) and the website (http://www.rootsweb.com/~waewgs). Put a reminder note on your computer, such as a Post-it note, an index card, etc. that says "Go to EWGS and click on RootsTV!" If you have more than one computer, or a computer at work, put a note on each one. Make a point each day to go to the blog AND website from each computer you have access to and visit RootsTelevision! Another idea is to make the website or blog your home page. To do this on Internet Explorer, at the top of your browser window, go to Tools, then choose Internet Options. When the mini-window opens up, make sure it is on the General tab. Under home page, type in the blog and/or website addresses (if you type in both, separate them by a comma). This will make the website or blog (or both) the first page(s) you see when you go online, and hopefully remind you to click on the RootsTelevision link! If you have Mozilla Firefox, go to Tools, then Options, then select the Main tab. Under "Startup: When Firefox starts:" choose "Show my home page" from the drop-down menu. Then type the blog or website address in the Home Page box. I don't have a Mac, so I can't help you there, but it has to be similar to Explorer and Firefox. Mac users, if you know how to set this up, please leave a comment or send me a message: kidmiffatgmaildotcom (replace the green letters with the correct symbols). We've just got three more days, folks! C'mon! We can do it! The other October 31st deadline is for the seventh annual EWGS Literary Competition, the topic of which is "An Ancestor I Wish I Could Talk To and Why." Entries are limited to approximately 1,000 - 2,000 words. Complete documentation is not necessary, but the judges would like you to state the sources of your information. Entries must be typewritten (or published in a word-processing program, such as Microsoft Word) and sent to Doris Woodward (see the member directory for her contact information). First prize is a $100 gift certificate to a genealogical book publisher, while second prize is a $50 gift certificate to the same. All stories will be printed in The Bulletin over the next year (EWGS reserves the right to edit). This is a lot of fun, folks! I entered last time ("My Favorite Military Ancestor" was the theme) and won second prize, netting me two much-coveted genealogical books. It was so fascinating to read all the interesting stories in The Bulletin, as well! Doris has not gotten a lot of entries so far, so whip up a good story and send it on in! How Do You Spell Hartal? If you saw Monday's Spokesman-Review (story at the top link here), you may have seen the humorous front page photo of Chief of Police Anne Kirkpatrick and her team, "Crime and Punishment," as Whitworth University professor Dr. Victor Bobb announced that they were the first to be eliminated from the Spokane is Spelling adult spelling bee. This fund raising event was held at The Big Easy Concert House last Sunday, October 21st, at 4:00 PM. Three members of the Eastern Washington Genealogical Society formed "The Genealogists" team in order to support the Spokane Public Library Foundation and get our society's image out to the public. The team consisted of President Bill Hire, Distinguished Service Member and EWGS Bulletin editor Doris Woodward, and myself. We were very excited and a little nervous about participating. There were some well-known Spokane names and faces among both the participants and the audience, including Washington State Senator Chris Marr, Spokane Public Schools Board of Education President Christie Querna (participants), and Mayor Dennis Hession (audience). Directly behind us in line were Spokane Symphony Orchestra members Brenda Neinhouse and Don Nelson, with Maestra Eckart Preu...and were they ever a riot! When the word "requiem" came up for another team, the SSO team groaned. Of course, their team was not going to be lucky enough to get any of the music vocabulary as spelling words! The first two rounds consisted of fifth- and sixth- grade words, to shake out our nerves and--as emcee Mike Gonzalez retorted--to see if were were "smarter than a fifth-grader"! Our first word was "party." Easy enough. Rounds Three and Four brought harder words: "centaur" and "deterrent". Then Round Five brought the challenge: "hartal". Bill and Doris had conflicting spellings. They're both sharp spellers, but on the pad we were supplied, Bill wrote h-a-r-t-o-l, while Doris had h-a-r-t-a-l. I was the team's announcer, and we had 15 seconds from the time the word was announced and the definition given before we had to give the correct spelling. Together, we made a snap judgment, and chose Bill's spelling. All we could say was that at least we were eliminated on a toughie! We didn't do too badly, getting knocked about about halfway through; there were 26 teams total. "The Pacific Northwest Inlander" team won, then had to compete among themselves for the final grand prize, a $1000 shopping spree at River Park Square, dinner for two at Fugazzi and an overnight stay in the penthouse suite at Hotel Lusso. Michael Bowen won with the word "urceolate". Whew! Ancestry posted the results of their survey of 10,000 members to find out what materials they wanted more of. Click here to see the results. Do you agree with the results?? Here are the comments of Randy Seaver. Today's Spokesman-Review (Thursday, 25 Oct 2007) carried this article: "Tiny quakes shaking Wandermere area." Apparently, Spokane and northeast Washington have undergone a series of minor earthquakes in the past two months....but most, if not all, were too small to be felt. Such was not the case back in June 2001 when a rattler of 3.7 size woke up Spokane residents at 7:15am. If you'd like to know more about earthquakes in the Spokane area, watch for our Eastern Washington Genealogical Society's Bulletin, next issue. Made me think.......do earthquakes happen pretty much everywhere? How did earthquakes affect our ancestors' lives?? Have they affected yours?? SALT LAKE CITY—The National Archives and Records Administration (NARA) of the United States and FamilySearch today announced an agreement that will lead to the digitization of millions of historical documents over time. The bulk of the digital images and related indices will be freely accessible through www.FamilySearch.org, 4,500 family history centers worldwide, or at the National Archives and its Regional Centers. The agreement is the result of several years of discussions between the two organizations and NARA’s new long-term strategy for digitizing and making available major segments of its vast collection online to the public. Ultimately, the records digitized by FamilySearch will consist of court, military, land, and other government records that include information of genealogical significance for family historians. The records date as early as 1754 to as late as the 1990s. Almost all of the records in the National Archives currently are not readily accessible to patrons who visit the National Archives or one of its regional facilities. The newly digitized and indexed records produced under the agreement will be available online—greatly increasing patron access. “For a number of years, we have had a very productive relationship with FamilySearch,” said Professor Allen Weinstein, archivist of the United States. “This agreement expands our relationship to enable online access to some of the most popular and voluminous records in our holdings. It is an exciting step forward for our institutions and for the American people,” he added. Under the new agreement, FamilySearch will be operating highly specialized digital cameras 5 days a week at the National Archives in Washington, D.C. FamilySearch intends to extend the digitization services to select regional facilities at a later date. That means there will be a continuous flow of new data for genealogy buffs to explore for years to come. It also means FamilySearch will be able to digitize the thousands of microfilms it has already created from NARA’s holdings—providing access to millions of images for genealogists to search from the convenience of their home computers with Internet access. The first fruit of this effort is a portion of a very large collection of Civil War records, already underway. In this pilot project, FamilySearch will digitize the first 3,150 Civil War widow pension application files (approximately 500,000 pages). After digitization, these historical documents will be indexed and posted online by Footnote.com with the indices also available for free on www.FamilySearch.org. FamilySearch intends to do all 1,280,000 of these files over the coming years. James Hastings, director of Access Programs at the National Archives, said, "For decades the National Archives has helped thousands of researchers gain access to this rich trove of records in Washington. Thanks to this agreement with FamilySearch, this valuable information will now be available to millions of users around the world in a far more accessible format." FamilySearch is the largest international organization of its kind, working with national archives and record custodians worldwide to preserve and increase access to records of genealogical significance. It is currently working on projects in over 45 countries. About the National Archives. The National Archives and Records Administration, an independent federal agency, is the nation's record keeper. Founded in 1934, its mission is unique—to serve American democracy by safeguarding and preserving the records of our Government, ensuring that the people can discover, use, and learn from this documentary heritage. The National Archives ensures continuing access to the essential documentation of the rights of American citizens and the actions of their government. It supports democracy, promotes civic education, and facilitates historical understanding of our national experience. The National Archives meets a wide range of information needs, among them helping people to trace their families' history, making it possible for veterans to prove their entitlement to medical and other benefits, and preserving original White House records. The National Archives carries out its mission through a nationwide network of archives, records centers, and Presidential Libraries, and on the Internet at www.archives.gov. About FamilySearch. The Genealogical Society of Utah (GSU)—doing business as FamilySearch—is a nonprofit organization sponsored by The Church of Jesus Christ of Latter-day Saints. FamilySearch maintains the world's largest repository of genealogical resources; these resources may be accessed through FamilySearch.org, the Family History Library in Salt Lake City, Utah, and over 4,500 family history centers in 70 countries. FamilySearch is a trademark licensed to GSU and is registered in the United States of America and other countries. Georgia's state death index from 1919 - 1927 is now available online with links to digital images of original death certificates. Details are here. The parent company that owns Ancestry.com, The Generations Network, has been acquired by Spectrum Equity Investors. Details are here, and a current list of commentary and interviews of CEO Tim Sullivan are here. Craig Manson, a genea-blogging law professor, has published a new series of law lessons entitled "Defamation and Privacy Issues in Genealogy" on his blog, GeneaBlogie. The first post is here. Craig's last series on the law regarding genealogy was about whether Ancestry.com violated copyright law with its Internet Biographical Database (part one of that series is here). On September 15, Judy Rand Williams presented her class on German Resources Online to EWGS members in the Gates Computer Lab at the downtown public library. She showed how she used the Google search engine to find links to helpful websites on the Internet for German genealogy, history, translation help, maps and other resources. As in any of our classes, actually sitting down at a computer station and practicing and experimenting with the help of an instructor and one's peers can yield some magnificent results! I personally enjoyed Judy's class, although I only have very little German ancestry. A few other members in her 10:15 class had so much fun looking at various websites that they returned for her 11:30 class to surf the web as a group some more! If you took Judy's class, I invite you to leave your comments on what you learned from her presentation to share with other members and readers. To leave a comment, click at the bottom of this post (article) where it says "0 COMMENTS" (the zero may be replaced by a different number, depending if others have already commented). Type your comment in the box that will be provided. To "Choose Your Identity," you can use your Blogger user name if your have one; if not, click on "Other" and enter your name and the name of your website, if you have one. (Anonymous comments will not be cleared by me.) Then click "Publish Your Comment." The comment will be e-mailed to me for clearance before being published (this is to prevent spam and inappropriate comments by the public, as this blog is viewable all over the world). If you missed Judy's class and would like a syllabus, please e-mail me (see your EWGS member directory for my e-mail address - Miriam Robbins Midkiff). You can also see our list of upcoming computer classes here. I am signing members up for next year's classes, so you can e-mail me with the list and times of classes you would like to take. This new database may not help your personal genealogy one bit, but just think: Isn't it exciting that more and more of the unusual is appearing online??? SALT LAKE CITY—The Utah State Archives and Record Service and FamilySearch announced today that digital images of the state’s historic brand books are now available at http://historyresearch.utah.gov/digital/540.htm. FamilySearch digitized the state’s brand books from about 1849 to 1930, which were then added to the Utah State Archives’ Digital Collections. A free, full text search and name index link to the newly available images. Brand books officially started in 1851 to prevent the duplicate use of brands by local livestock owners and as a means to identify and control animal inventory. Information included in a brand entry could be a helpful and interesting addition to a family’s history. "Brand books have been a popular request in the research center for years. We are happy that more researchers will not only be able to view and print from these books anywhere and anytime, but that more might discover this unique resource from Utah's history," said Gina Strack, digital coordinator for the Utah State Archives. Brands have been registered in Utah since 1851 and include all brands and ear marks registered with the State Department of Agriculture. According to the database, over 42,000 livestock owners used brands to help distinguish their animals from the livestock of other owners. Later, as regulations expanded state control over inspection for disease, transportation, and slaughter of livestock, maintenance of a central brand registry became even more important. “Family historians might find some of the information in the brand entries fun, interesting, or helpful in providing context to their family stories,” said Wayne Metcalfe, director for FamilySearch Record Services. Entries in the brand books include the brand symbol, the name of the person registering the mark or brand, the location on the body of the animal, the county of residence of the applicant, and the date the brand was recorded. Illustrations of where the marks and brands appeared on the body were added to the books in 1901, as were the names of brand owners. “How many people know about or have a picture of the family’s official animal brand? That would be a fun conversation piece to any family history discussion or collection,” Metcalfe added. Holdings of the brand books are not complete. The law regulating the printing of brand books was passed by the first session of the territorial legislature in 1851. It required the general recorder to furnish printed copies of all marks and brands to the clerks of different counties. The brands were published and distributed to all county clerks. FamilySearch is a nonprofit organization sponsored by The Church of Jesus Christ of Latter-day Saints. FamilySearch maintains the world's largest repository of genealogical resources accessed through FamilySearch.org, the Family History Library in Salt Lake City, and over 4,500 family history centers in 70 countries. October is Washington State Archives Month; see their home page here. Last week I read a notice about the New York Times opening up their archives. They are every name search able from 1851 to the present, but some you can not view online due to the copyright. (Note: The Spokane downtown library has the ones not online on microfilm). While you probably will not find your ancestor in the Times, you can search for the ship they came on. I searched for my grandfather's ship, the SS Nevada, and about 20 hits came up, several close to when he came to the USA. Another tip is to search for your ancestors hometown. I searched for my grandfather's town in Minnesota (Wadena), and got a few hits. Searching for Spokane brought up coverage of the Spokane Fire in 1889. IG for one year is $28. Call toll free 888-326-2476. Tell them Donna sends you. Internet Genealogy magazine is the way to stay current with all the new wonderful happenings in the online genealogy world. All researchers should use tithable lists, which were annual head taxes that were levied on residents. Because land and personal property were generally NOT taxed in the early colonies, the tithable lists are about the only colonial period tax records we can use. There were acts setting the amount of tax in 1629, 1632 and 1639 and the word "tithable" does not appear in the law statutes until 1643. As counties and parishes were established, there was naturally a need to collect revenue, therefore making subsequent statutes necessary, in order to define all factors. There were various acts from 1643 through 1748 and the main thing was to identify the people, not in a physical household, but rather a taxable one. Still, existing lists may be county lists or even parish lists which could be originals, copies, or lists that were actually entered by the county or vestry clerk. The origins of the list, therefore, determines the likely accuracy and we must keep in mind a justice's list or a clerk's list may very well spell the same name differently. As the colonies became independent, the tax system changed to taxing mainly males over 16 as well as to taxes on personal property and land. If you are researching Virginia, it is a good idea to check "The Statutes at Large: Being a Collection of All the Laws of Virginia" by Wm. W. Hening, editor. Vol. 1, p. 128. You need to carefully check the applicable laws and the county clerk records to interpret tithables lists made during the period of interest.